Just a quick update to make certain you are comfortable with the process of granting your advisees "Permission to Register" beginning next Monday so they will be able to register once online registration opens on Monday, April 16. "Grant Permission to Register" happens at the beginning of each advising & registration period and allows the student to register for courses when the registration period opens. Just a note - you are still required to submit "Grant Permission to Register" for your advisees during this current advising period for Fall 2018 registration, but we are working on changing the process to remove this requirement for subsequent semesters. Here's how it works using screenshots to walk you through the process. More information can be found at "Instruction Manual for Advising & Registration." Remember, if you don't properly click the "Grant Permission to Register," your Advisees will not be able to register for classes when their online registration period opens. Once you have met with your Advisees and reviewed their course selections and schedules, you then must grant them permission to register. 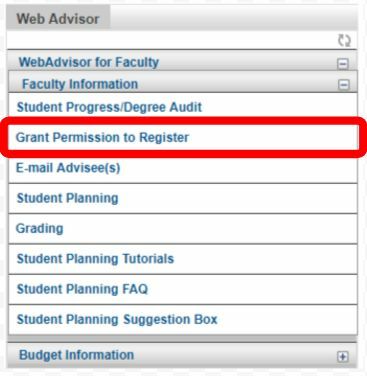 To do so, start by clicking on the "Grant Permission to Register" bar in the WebAdvisor Menu as seen in the screenshot below. Next, you will see the following screen that shows a list of your Advisees. When you hover over the box next to the name of your Advisee, “Grant Permission to Register” will appear. Click the box next to the name of the student you want to give permission to register and then click SUBMIT as seen at the bottom of the screenshot. A date and a checked box will appear next to the name you’ve approved as you see in the screenshot below. Please remember, permission to register cannot be reversed once you’ve submitted. That's the process - nothing else is required. Your Advisees will know if they have received permission to register by looking at their schedules in Student Planning. This first screenshot is what the students will see if you have NOT yet given permission. The screenshot below is what the students will see once you HAVE granted permission for them to register. If you have questions, please email registrar@barnard.edu. Student Planning opens for students to begin planning their fall class schedules. Meet with your Advisees and grant them “Permission to Register” in WebAdvisor.